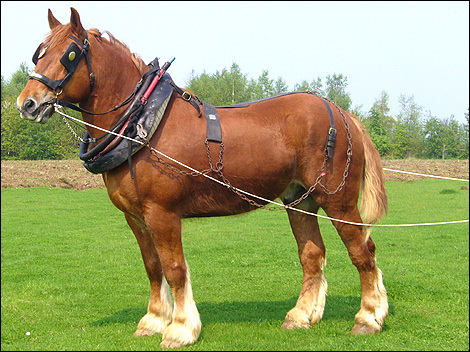 The Suffolk Punch is a breed of work horse first mentioned in 1586. It takes its name from the county of Suffolk England and punch to describe its strength and solid build. The local farmers needed a draught horse with power, stamina, health, longevity, and docility for farm work. Genetics show that the Suffolk Punch is closely genetically grouped with the Fell and Dales British ponies and the European Haflinger. The breed nearly died out but was saved in 1768 by a horse owned by Thomas Crisp of Ufford and was simply known as ‘Crisp’s horse’. The Suffolk Horse Society, was formed in Britain in 1877 to promote the Suffolk Punch and started to be exported all over the world. Canada in 1865 United States in 1880 and later to France, Spain, Germany, Russia, Sweden, Africa, New Zealand, Australia, Argentina and many more.